Next Saturday, Oct. 29, we’ve got two fun events going on! At noon, we’re holding a special free drop-in workshop for anyone who’s wanted to try improv. It’ll be a lot of fun and a perfect time to dip your toe in the water. Register ahead of time to secure a spot. 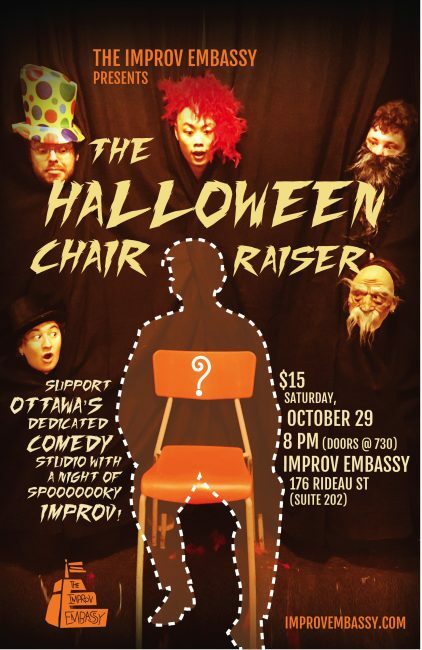 Saturday night we have a really fun fundraiser planned — our Halloween cHAIRraiser! The show will feature a murder mystery comedy, improv inspired by Goosebumps books, and lots more. More details here. The Improv Embassy is a volunteer-run nonprofit and this show will help us recoup some of our startup costs. Plus, you get to put your name on one of our chairs! What’s not to love? ?